The body's natural process of oxidation creates "free radicals." As you age, these molecules damage and sometimes kill cells by taking electrons from them, which changes the cells' structures and functions. Antioxidants fight cellular damage by giving free radicals electrons. While you can take supplements or use topical products that contain antioxidants, the best source is dietary. The National Center for Complementary and Alternative Medicine urges caution in the use of synthetic antioxidants. More studies need to be done on their efficacy, and consuming excessive amounts of antioxidants may actually be harmful. 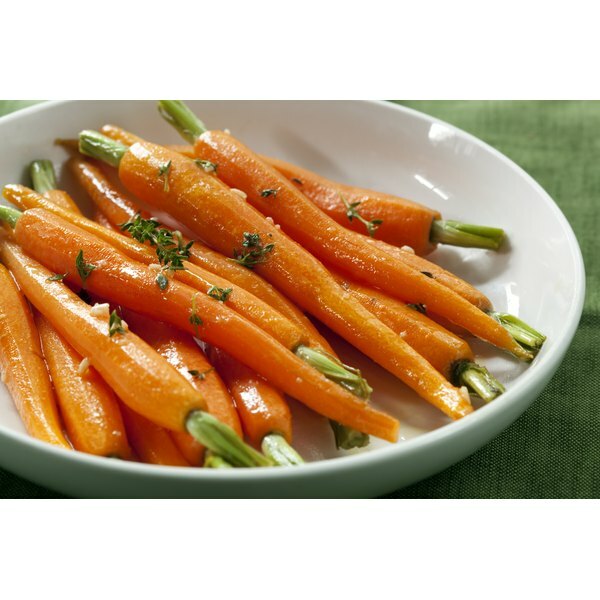 Once in the body, beta-carotene converts to vitamin A, which is necessary to keep mucus membranes and skin healthy. The University of Maryland Medical Center considers beta-carotene a safe source of vitamin A, since the body will stop converting beta-carotene on its own when it doesn't need any more vitamin A. Taking vitamin A in supplement form can lead to negative consequences since your body may receive more of the vitamin than it can safely handle. Yellow and orange fruits and vegetables, such as carrots, cantaloupe and squashes, are good dietary sources of beta-carotene. According to the University of Michigan Health System website, beta-carotene from these natural sources is more effective in protecting the skin, especially from sunburns. Dermatologists prescribe topical vitamin A derivatives called retinoids for treating acne. They may also be useful in treating prematurely aged and sun-damaged skin. A study published in the "Journal of Investigative Dermatology" by researchers at the University of Michigan concluded that vitamin A stimulates the production of collagen and reduces the matrix metalloproteinases caused by natural aging and sun damage. However, more studies are needed to confirm vitamin A and beta-carotene's safety and effect on skin. Selenium, a mineral and antioxidant that works best when combined with vitamin E, is found in high levels in Brazil nuts, liver, wheat germ, shellfish, tuna and brewer's yeast. Be cautious when taking selenium supplements: The University of Maryland Medical Center warns that it may increase your risk for developing diabetes. Selenium is available as a topical treatment that may protect skin from sun damage and wrinkles. One form, selenium sulfide, comes in lotion or cream form. Its primary use is in treating tinea versicolor, a fungus that affects the skin. In shampoo form, selenium fights dandruff and seborrheic dermatitis -- a condition that causes the skin to flake and become scaly in oily areas. Vitamin C, a plant-based, water-soluble vitamin, is necessary for the body to produce collagen and repair skin tissue. This is potentially helpful since decreased production of collagen is linked to aged skin. Lack of vitamin C results in skin that is dry, rough and easily bruised. You can take vitamin C supplements or eat blueberries, tomatoes, strawberries, oranges, pineapple, cranberries, potatoes or broccoli. A study published in the "Journal of the American Academy of Journalism" by researchers at Duke University Medical Center concluded that topical vitamin C provided protection from photoaging. It was particularly effective when combined with vitamin E.
Is it Safe for Pregnant Women to Wear Sunscreen?